After Flanders and Wallonia, it's the turn of Brussels to introduce a tougher driving theory test - from the end of this month. Candidates must score at least 41 out of 50 in the redesigned test, which includes compulsory questions on first aid and hazard perception. While most wrong answers lead to the loss of one point, serious mistakes attract a five-point penalty - and making two serious errors - such as crossing a continuous white line, running a red light or doing a U-turn on a motorway - means an automatic fail. A spokeswoman for examination body Goca said: "Candidates need to be honest with themselves. If a candidate makes two serious mistakes in the theory test, it means he or she is really not ready to get behind the wheel. Learner-drivers who fail the theory test twice must re-take a course in a driving school before they can sit the exam again. There were long queues outside some test centres in Wallonia at Christmas as candiates rushed to take the old theory test before the 1 January switch. There were even long waits outside examination centres in Anderlecht and Schaerbeek - even though the Brussels theory test was not changing at that time. A spokesperson for the Brussels-North police zone, which covers the Schaerbeek test centre, said officers would be closely monitoring how busy the site is in the run-up to the 30 April change. The Brussels-Midi police zone, which covers Anderlecht, added: "We will be vigilant and if we see that there are problems, we will step in." There are long lines of people wanting to take the test before 30.04.2018. You can also study the code and avoid 3rd & 4th-degree offenses. It makes more sense to study than to stay in line for hours ! Why is your picture no a raod in Belgium ? 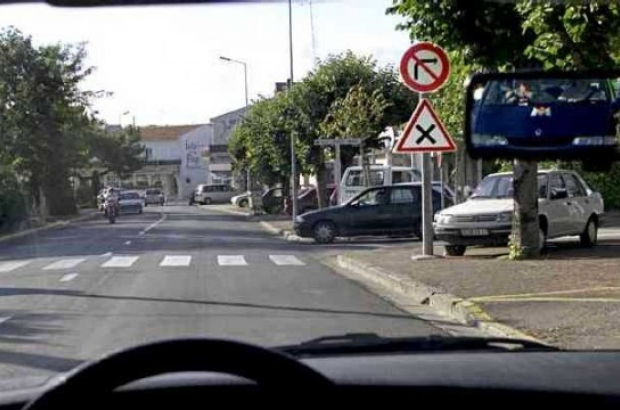 Road signs are from France, shapes are not exactly the same as in Belgium !